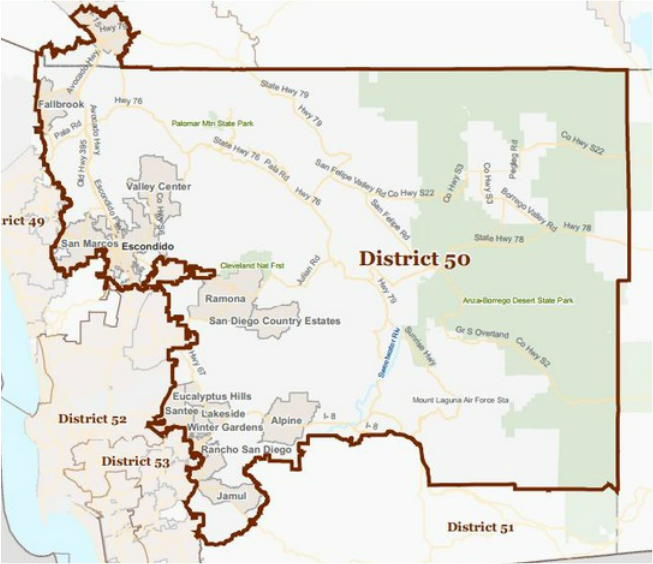 Republican Duncan Hunter currently represents Congressional District 50. Hunter is expected to easily win re-election in 2016. Congressman Duncan D. Hunter represents California's 50th Congressional District consisting of East and Northern County San Diego. In 2008, Hunter was elected to his first term in the House of Representatives, succeeding his father, Duncan L. Hunter, who retired after serving 14 consecutive terms in Congress. Hunter is a native of San Diego. He graduated from Granite Hills High School in El Cajon and earned a degree in Business Administration from San Diego State University. Hunter worked to pay for his education by creating websites and programming databases and ecommerce systems for high-tech companies. Immediately after graduation, he went to work full time in San Diego as a Business Analyst. Soon after our nation was attacked on September 11, 2001, Hunter quit his job and joined the United States Marine Corps. Hunter entered active service as a Lieutenant in 2002 and excelled in the area of field artillery, much like his grandfather, Robert O. Hunter, who was a Marine Corps artillery officer in World War II. Over the course of his service career, Hunter served three combat tours overseas: two in Iraq and one in Afghanistan. In 2003, Hunter deployed to Iraq with the 1st Marine Division. Hunter completed his second tour in 2004, where he and his fellow Marines were at the center of combat operations in Fallujah, Iraq. In September 2005, four years after he quit his job and joined the Marine Corps, Hunter was honorably discharged from active military service and started a successful residential development company. Still a Marine Reservist, he was promoted to the rank of Captain in 2006, and to the rank of Major in 2012. Less than two years before Hunter was elected, he was recalled to active duty and deployed to Afghanistan. Hunter returned home after more than six months on the front lines and, with the support of the San Diego community, became the first Marine combat veteran of the wars in Iraq and Afghanistan elected to Congress. Hunter is a strong conservative who is committed to strengthening national security, enforcing our borders, creating opportunities for American workers and protecting the interests of taxpayers. He is also a strong proponent of the Second Amendment, protecting traditional marriage and the rights of the unborn. Congressman Hunter and his wife live in Alpine, California. They are the proud parents of three children: Duncan, Elizabeth and Sarah.